The Dublin Bay Biosphere Biodiversity Conservation and Research Strategy 2016-2020 is now available to download on our website. This document sets out the planned biodiversity conservation and related research actions of Dublin Bay Biosphere Partnership from 2016-2020. It aims, firstly, to provide a coordinated framework for biodiversity conservation and research activities to be undertaken by Dublin Bay Biosphere Partnership and, secondly, to provide clarity regarding these planned activities to all stakeholders within Dublin Bay Biosphere. as well as consultant ecologists, biological recorders and local volunteers in an individual capacity. This group has met five times to date. Group members proposed, discussed and prioritised the actions of the Dublin Bay Biosphere Biodiversity Conservation and Research Strategy and will meet annually to review the implementation of the Strategy. A draft document was presented at the "Dublin Bay UNESCO Biosphere Conference: Connecting people and nature" and associated Research Networking workshop at University College Dublin on October 26th 2016 and was made available online on www.dublinbaybiosphere.ie for public consultation from October 25th to November 21st 2016. Biodiversity conservation and research actions were identified for key sites and the wider Biosphere. For each action, specific objectives, target habitats/species/taxonomic groups and responsible agencies were identified. Timelines were set out and costs have been estimated where possible. In total, there are 88 actions to be delivered, of which 30 relate to conservation management actions and 58 to research. The conservation management actions deal with the main issues affecting key sites and relate to the preparation and implementation of management plans and practical conservation activities. 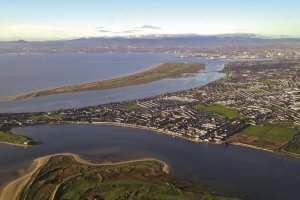 The research actions include numerous field studies, the results of which will give Dublin Bay Biosphere Partnership an improved understanding of the biodiversity of Dublin Bay Biosphere to underpin good conservation planning and decision-making. The Conservation Working Group met on March 7th 2017 to review progress to date in implementing the Dublin Bay Biosphere Biodiversity Conservation and Research Strategy. Numerous actions of the Strategy are already underway on sites including Ireland’s Eye, Baldoyle Bay, Howth Head, North Bull Island, Dublin Port and Dalkey Island.